Films like “Boyz N The Hood”, “Menace II Society”, “Dope”, “Straight Outta Compton”, portray a world for young men that is fraught with violence, poverty, and drugs. These films depict young black men struggling to escape, working to make ends meet by any means necessary, and many times falling into the trappings of their environment. Scroll through your social media feed or turn the television to any news agency and it’s easy to see that the reality of the fictionalized world isn’t too far off from the lived in world. 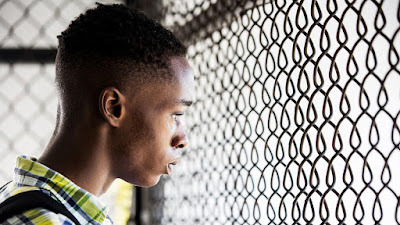 This makes Barry Jenkins film “Moonlight”, an adaptation of a play entitled “In Moonlight Black Boys Look Blue” by Tarell Alvin McCraney, an exceptional achievement in filmmaking. “Moonlight” displays how violence or the threat of violence can dehumanize and destroy young people, is shows the depth of poverty for entire communities, and it also illustrates the heartbreaking affect of drug abuse. But that is a small piece of a much bigger and breathtakingly beautiful story. 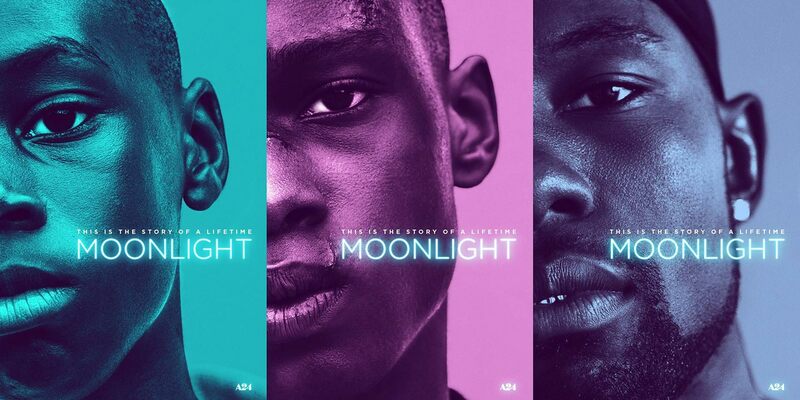 “Moonlight” is a film composed of moments, small pieces in the developing life of an adolescent child, who then becomes a maturing teenager, and finally grows into an adult man. Each piece portrays the same person but is played by different actors that fit the specific age. We are introduced to a young, quiet boy named Chiron (Alex R. Hibbert) running away from some kids who are trying to beat him up. Chiron, nicknamed Little, finds safety in an abandoned apartment. Juan (Mahershala Ali) is a local drug dealer who helps Chiron and offers him dinner and a place to sleep. Chiron lives in a housing project with his mother Paula (Naomie Harris), a drug addict who ignores and takes advantage of him. The story doesn’t stay here; Chiron is also portrayed as a self-conscious and confused teenager, tormented by a bully at his high school and befriended by a friend from his childhood. Chiron is then shown as an adult, a changed man with a confidence that is ultimately a protective mask so that he doesn’t have to experience the pain that has come to define his life. From the first frames “Moonlight” establishes a very calm, quiet quality. Even when the film becomes aggressive or ominous, a unique atmosphere is constructed that changes the way you analyze the emotions and attitudes of the characters. It almost feels like standing in the eye of the storm, watching destructive things happen all around you. Director Barry Jenkins begins to ask very tough questions from the beginning. Chiron answers many of these questions without words but rather with his actions. You can feel the discomfort, the awkwardness, the struggle, the pain, and the vulnerability in everything that he does. Mr. Jenkins shows significant restraint, never attempting to manipulate these themes but instead introducing them and letting the characters progress authentically and specifically. It would be easy to turn this film into a blatant perspective on race or a deliberate analysis on male gender roles, however Mr. Jenkins is both purposeful and ambiguous with his character choices. The director deconstructs aspects of race and gender, at times providing enough stereotype or easy categorization to then destroy whatever you perceived or assumed about the characters. The filmmaking technique utilized throughout compliments the narrative perfectly. The photography is exceptionally restrained and simplistic, composing that independent film look viewers are very keen to identify and manipulating it to create stunning moments of everyday life, both the delicate and painful moments. For instance the comfort of sitting at the dinner table in an early scene, the uncertainty of the beach at night in the second act, and the freedom of a road trip at the end of the film, it’s all utilized to bring more identification to Chiron’s changed character. The music also composes another powerful element as well, whether the use of Aretha Franklin’s “One Step Ahead” to bring definition in certain scenes, the classical pieces during transformative character transitions, or the use of the hip-hop song “Cell Therapy” by the group Goodie Mob in punctuate Chiron specifically within the framing of the story, it all serves a very important reason to the structure of the narrative and the development of the characters. It's some of the best use of music in film this year. “Moonlight” is a beautiful and at times complex film with exceptional performances all around. It’s a coming-of-age film, a film about sexual identification, a film exploring masculinity, a film that doesn’t succumb to easy stereotypes or simple exploitation. 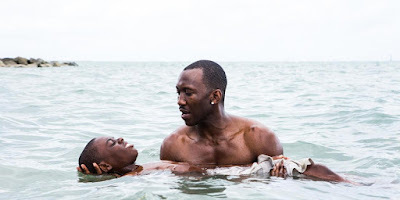 What “Moonlight” does best is show the power that a film can possess, and how that power has the ability to transcend, destroy barriers of preconception.